Even if you live in a gated community with around the clock security, your home is still vulnerable. At least it would be if you hire worker you know nothing about. You would be bringing that person right through all that security and into your home. Even if they don’t steal anything, an unlicensed contractor could cause plenty of damage. That’s why you need to do your homework before you hire any type of worker including someone who might not even by at your home past thirty-minutes. Consider the task of junk removal. That is a job that is not going to take a lot of time unless you’re involved in a hoarder cleanup. Junk King is a professional junk removal company who is part of a national franchise that has been in operation since 2005. Clearly, they must be doing something right! The founders of Junk King released the value of this type of professional service. But just because you get paid for the service doesn’t make you a true professional. Junk King starts out by providing a two-man crew for every junk removal appointment. That crew has been licensed, bonded and insured. There is no compromise when it comes to that type of certification for Junk King workers. The Junk King workers have also been properly train on the best moving methods for bulky and heavy objects. They also will know how to dismantle any object in order to get it to fit on the truck or make it out the door. They’ve even been known to saw a hot tub in half to make sure it can be properly disposed off. All you have to do is point to what you want removed and it is as good as gone! Junk King’s professionalism goes beyond the efficient job they’ll perform with your junk removal. They will also be going the extra step with their eco-friendly disposal policies. Since they started, Junk King has been dedicated to keeping the majority of what they collect out of landfills. They would much rather drop something off at a charity or recycling center than at a nearby dump. 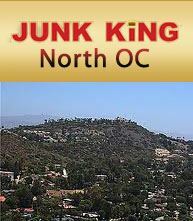 Finally, you can depend on Junk King for a fair and affordable price. Their fees are always based on volume and not weight. When it comes to feeling safe with your junk removal, Junk King is the only way to go. This entry was posted in Junk Removal Team and tagged Junk King, Junk Removal Team on December 18, 2014 by Junk King. Last updated July 31, 2017 .